Khan Academy is an educational organization that creates short educational videos that serve as lectures on over 5,000 different topics. 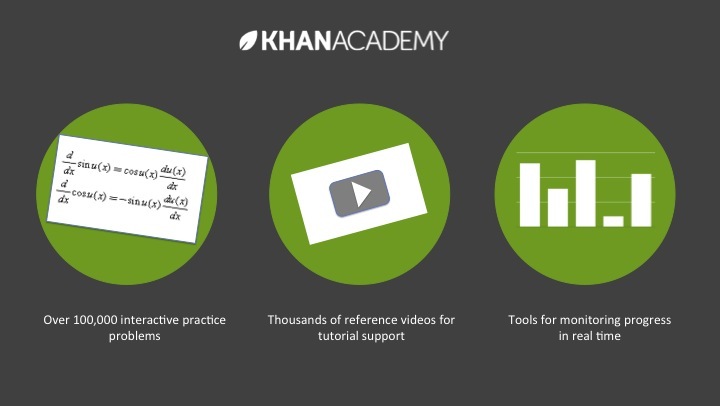 Khan Academy also has educational materials, including practice problems and exercises for educators, that enhance learning with these videos. 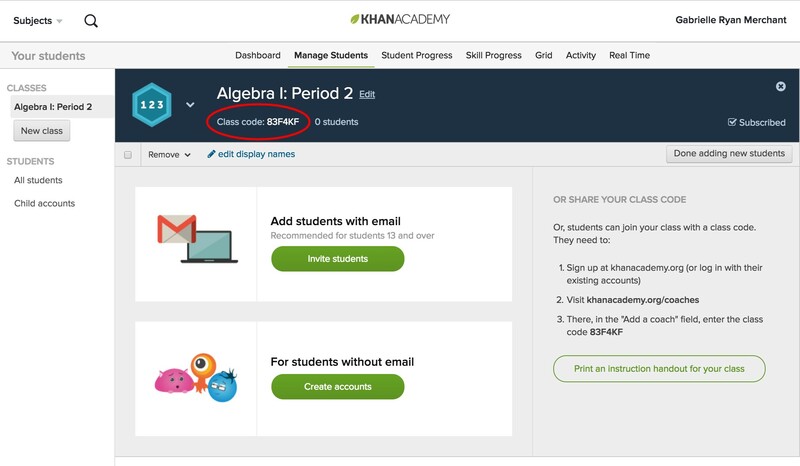 Khan Academy allows for the personalization of education, offering students an opportunity to self-pace through lessons that are scaled to their current level of understanding, and moving them forward only once they have mastered a topic within a lesson. Khan Academy was founded in genuine and humble roots in 2004 by Salman Khan, who used the initial videos to help tutor one of his cousins. The best part is that Khan Academy is completely free for anyone and everyone, and the organization is committed to keeping it that way forever. Khan Academy allows for students to self-pace through material, and scales material based on student progress, something that is impossible in a traditional classroom. Students can be linked to “coaches” who can be their classroom teacher, a parent, a tutor, or a peer-tutor. The coach can track student progress and intervene and make suggestions based on student progress. For example, if a student does not seem to be mastering a topic, a coach can identify if the student watched the lesson completely, completed an adequate number of practice problems, etc. It is a great tool for flipped classrooms, personalized learning, and blended learning, ensuring that you are meeting the learning needs of ALL of your students and not just teaching at the pace of your “average” student. Substitution: Videos replace traditional lectures a student would get from their teacher. Augmentation: Khan Academy scales material to student needs, allowing them to work and learn at their own pace. 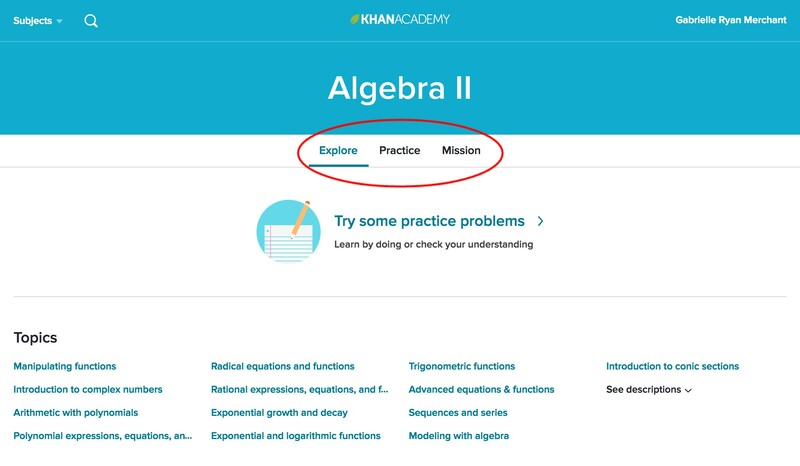 Khan Academy also has tools that track students progress, allowing them to pick up where they left off in a lesson, as well as giving coaches the ability to see if their students watched lessons in full, see how many practice problems they completed, and at what stage of a mission they are at. Modification: Set up a station-rotation model in your classroom. Split your class into 3 groups. Each group begins by watching a Khan Academy lesson. The group then moves on to teacher-led instruction based on that lesson, but in a much smaller group and thus with significantly more interaction between student and teacher. Finally, the last station ends with students working together collaboratively on assignments based on the lesson. You can also use Khan Academy to flip your classroom. Have students watch lessons at home (where they would otherwise be doing homework) and complete interactive activities and assignments in the classroom collaboratively with classmates and with direct teacher assistance that students would not get if doing assignments at home. This capitalizes on precious classroom time. Instead of students passively listening to a lecture and going home to complete assignments, the teacher uses the classroom to work students through assignments. This also allows students to work through a video lesson at their own pace – rewinding, and pausing, as needed. Redefinition: Students can learn from hundreds of teachers, not just the one they have in the classroom. Videos can supplement in-class lessons for added instruction and practice for students who need it. In addition, online discussion forums allow interactions regarding a given lesson with students and experts from around the globe. Khan Academy is completely translated into several other languages as well. 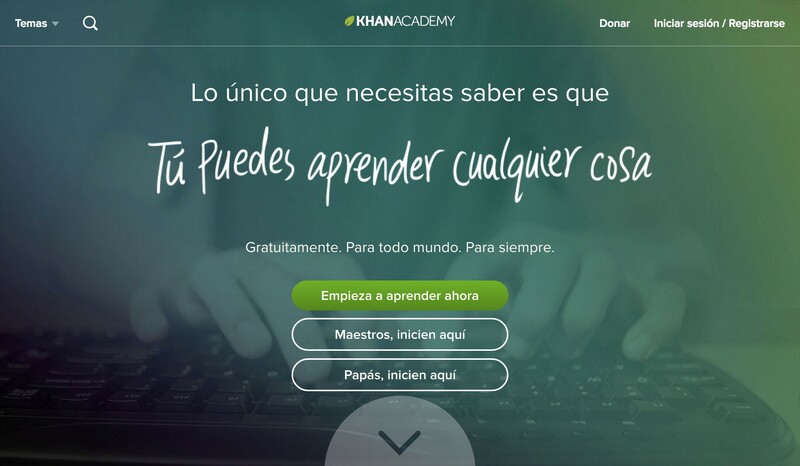 Use Khan Academy Spanish, for example, to help an ESL student master a topic like Algebra when the language-barrier is hindering learning progress. 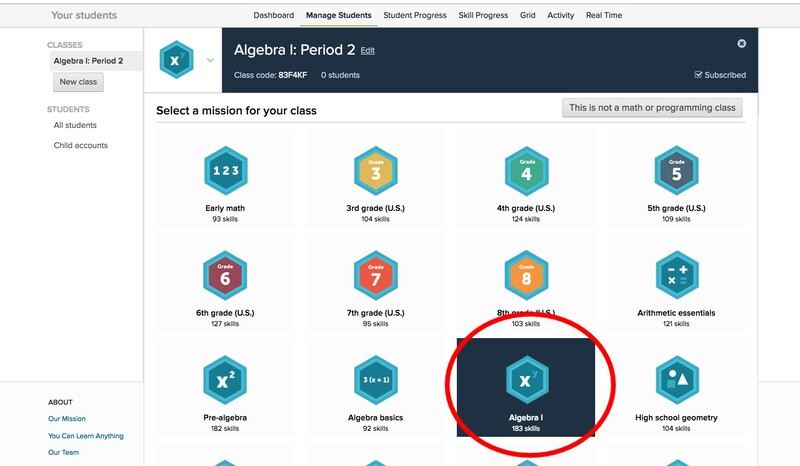 Middle School (Grades 6-8): Flip your classroom: assign Khan Academy material or missions to students and use class time to complete additional practice and exercises, answer questions, and build upon what they learned in the videos. High School (Grades 9-12): For a Science course: have students browse Khan Academy topics under Health & Medicine. Have each student give a short presentation in the class about what they learned, and how it connects to two concepts that have been discussed in class. Higher Education (and all grade levels): Challenge your students to watch several Khan Academy videos (on any topic) and then make their own for a given assigned topic that a Khan Academy video does not exist for, as opposed to writing a paper or giving a PowerPoint presentation. To use with registering: Click “Sign Up” and register for an account. You may sign-up with your Facebook, Google login, or email address. Choose a mission for your class. If, for example, you are teaching Algebra I, select the Algebra I mission. 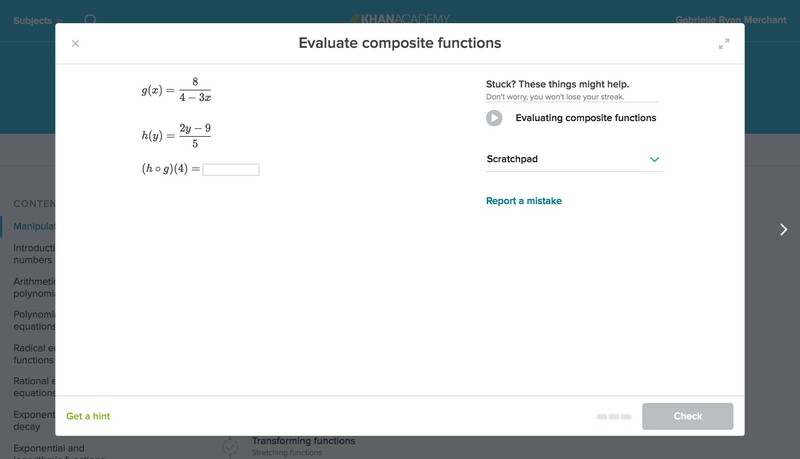 “Khan Academy: Algebra 1” [Screenshot]. Add students by email or by Khan Academy account username, or share your class code with your students to add the class themselves. For students: Students can utilize Khan Academy to explore material, practice material with problems, or work through a mission, which is content curated for students to work through a specific topic or grade-level at their own pace. Under a topic, click “Explore”, “Practice”, or “Mission”. “Khan Academy: Algebra 2” [Screenshot]. Students can explore videos of different topics by clicking links under “Topics” or by using the search function and watching corresponding videos and lessons. Students can practice problems within a topic by clicking on “Practice.” There is a scratch pad if a student needs to write or draw to help solve a problem, and there are also embedded videos if a student does not know how to solve a practice problem. Missions guide learners through self-curated material for a specific grade level or subject. Students can work through missions at their own pace, and only move on once they have mastered a lesson. Thompson, C. (2011). How Khan Academy is changing the rules of education. Wired Magazine, 126, 1-5. Noer, M. (2012). One man, one computer, 10 million students: How Khan Academy is reinventing education. Murphy, R., Gallagher, L., Krumm, A. E., Mislevy, J., & Hafter, A. (2014). Research on the use of Khan Academy in schools: Research brief.